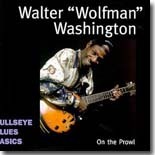 I went digging through my CD rack after recently seeing Walter "Wolfman" Washington in an excellent show he did in Phoenix as part of the Joe Krown Trio. To my horror, I realized that I was woefully short of some of his earlier Rounder recordings, having never converted the vinyl versions of those fine albums. With Christmas only a few weeks away at that point, I added On The Prowl, a collection of recordings from his first three Rounder recordings, to my wish list. Santa heard my plea, and this great set of Wolfman songs was under the tree on Christmas morning. Wolfman's first album, Wolf Tracks, gets the heaviest representation here with five cuts. Also included are four tracks from Out of the Dark and three from Wolf at the Door. It's been so long since I listened to any of these album, I had forgotten just how much fun it was hearing the New Orleans' native's blend of blues, soul, funk and jazz. On The Prowl kicks off with the satisfying mid-tempo number "You Got Me Worried," on which the Wolfman shows off his growlin' vocals and tasteful blues guitar licks. The horn section, led by saxophonist Bill "Foots" Samuel, nicely complements both Washington and the rhythm section. I did a radio interview with the Wolfman back in the late '80s when my Blues Hangover show was airing in North Carolina. During our discussion I asked him why he did so many Tyrone Davis songs. Washington replied, with a big grin on his face, "Because I like Tyrone Davis," drawing out the word like for several seconds. His appreciation for Davis' music is heard here on a wonderful cover of "Can I Change My Mind" that at times sounds faithful to the original but is liberally infused with a heavy dose of the Wolfman's guitar riffs. The next cut moves over to the Wolfman's second album with its title cut, "Out of the Dark," a snaky, late night jazz number that has him stretching out both his voice and his guitar. Washington's vocals move into a very high register at times. The same horn section as on the first album returns, but now the Wolf is joined by the same rhythm section (Jack Cruz on bass, Jon Cleary on keyboards and Wilbert "Junk Yard Dog" Arnold on drums) that backed him on many subsequent albums and tours. Wolfman's signature party stomper, "It Was Fun While It Lasted," featured co-vocals with New Orleans singer Timothea, who was a regular band member and songwriting collaborator around the time of the release of the first album. I haven't been able to get the words of this song out of my head since first hearing it in 1986 --- nor do I want to! "I'm Tiptoeing Through" is another Wolfman standard from the first album. Right after letting loose with a howl, he announces his attentions that he's tiptoeing through your town and just wants to fool around with you. A lot of porch lights probably come on every time he sings this song. I don't recall "It Doesn't Really Matter" from the original release of Wolf at the Door, which is surprising due to the strength of this gospel-infused number highlighted by Cleary's churchy piano playing and the female chorus provided by Elaine, Lisa and Sharon Foster. It's inspirational, to say the least! One of the best of his early recordings. The ultra funky "On the Prowl" is an instrumental punctuated by Washington's wolf howls and some exceptional sax work from Samuel. His guitar work is very tasty, too. Johnny "Guitar" Watson's funky party anthem, "You Can Stay But the Noise Must Go," is still part of Washington's live shows --- at least I heard him do it last year with the Joe Krown Trio. It's also on the CD, Live at the Maple Leaf, that he recorded with Krown and drummer Russell Batiste. This one's just way too much fun. Listening to On The Prowl brought back so many pleasant memories of one of the lesser known but best bluesmen in the last 25 years. Thank you, Santa.